Although he was well-known to the Afro-Caribbean community of his home borough of Handsworth by the time he was fifteen, the young Zephaniah quickly became disillusioned with preaching black issues to a black only audience and decided, at the age of 22, to move to London. He is often described as being on a one man mission to spread the word about poetry. Anti-establishment but happy to stand next to the establishment and talk about social issues, politics and the environment, Zephaniah is honest about his own upbringing and that he was one of those many angry young men who fractured the odd law here and there. In his youth he was arrested for burglary and he left school at the age of 13, unable to read or write. Despite this, his first collection of poems, Pen Rhythm, was published in 1980 and sold well, but it was live performances laced with dub Reggae rhythms that would push Zephaniah forward as a poet for the 80s and 90s. These were times of homelessness, racial tensions amidst strict stop and search laws, and wide ranging unemployment. Throughout, Zephaniah toured and read his poems out loud, entertaining people from all walks of life with his energetic delivery and cutting humour. 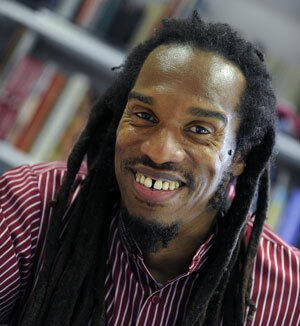 Throughout the 80s and 90s Zephaniah become one of the most filmed, most photographed and most listened to British poets of recent years. A regular at political rallies and on television, his poetry has always ranged from the angry to the humorous, better delivered live than read. He is a strong proponent of the oral tradition, taking his words out to the masses as an antidote to dry academia that he believes has for so long sucked the life out of poetry. His words have been heard far and wide, in live performances and on records, CDs and DVDs. He has been in South Africa, Zimbabwe, India and Pakistan and in 1991 he performed on every continent of the world in a period of 22 days. He has performed for Nelson Mandela, rejected an OBE, and given numerous honorary doctorates from universities. Perhaps his enthusiastic, musical delivery is what also attracts children to his poetry. He has produced several works for a younger audience, the most famous of which is Talking Turkeys which sold out in the space of 6 weeks when it was released in 1995. If there is such a thing as a people’s poet, the Benjamin Zephaniah has all the right credentials. Whilst the establishment has reluctantly embraced him as the years have gone by, he remains a voice for the ordinary man, someone who crosses boundaries and continues to speak his mind and raise the issues that should concern us all.